The next century of Westover family history is a dramatic tale of faith, loss, and redemption. These strong pioneers would endure hardships and blessings while overcoming incredible obstacles and living lives of sterling example. They pushed handcarts, built temples, crossed the ocean, and made the desert blossom as a rose. It began as Alexander Westover took Electa Beal as his bride and they vowed to build their family together. They had four children, the eldest being Edwin Ruthven. Another son, Albert, did not survive infancy but two younger sons, Charles and Oscar, did. Staking a claim in Northern Ohio near family on both sides would eventually bring growing prosperity to this generation of Westovers. But it was not to be. When Alexander died at the age of 36 he left his family destitute and unable to continue on the family farm in Goshen, Ohio. It devastated Electa to do it but she had no choice: she farmed her boys out to family members and friends because she could not provide for them. For ten long years Electa suffered from a broken heart, not knowing how she could ever get her family back together. The family fates changed in 1844 when Mormon missionaries were sent 60 miles from the home of Electa’s convert sister. Mormonism brought the Westovers together again — and pushed them ever westward. Electa went on to live a life steeped in family service and faithful church activity. Eldest son Edwin married the year before his mother Electa joined the church. Edwin and his wife Sarah began their family when Edwin, Jr. was born. But a few months after the baby was born Sarah died, leaving Edwin a widower and Edwin, Jr. without a mother. It seemed that Electa’s history was repeating itself in the life of her son Edwin. Together they moved to Winter Quarters and in 1848 were part of Brigham Young’s 2nd wagon train west. It was as part of that massive company that Edwin found another bride, also named Sarah, who he married after arriving in Salt Lake. In 1856 the handcart companies began the trek west and in the 2nd company to arrive on September 26th of that year was the Findley family of Scotland. They had been members of the Church for more than a decade and had saved for years to make the trek west. Among them was 17 year old Ann Findley. The Findleys arrived and settled first in what we now call the Fort Union area of Salt Lake City. They were neighbors to the Westovers. In the winter of 1857, Edwin took Ann as his plural wife. Over the course of the next 12 years they would have five children together. As Ann followed Edwin all over southern Utah as he served various missions for the Church her parents and her brother moved to Mendon, Utah in Cache Valley. While she was pregnant with her fifth baby Ann received word that her brother William had passed away suddenly and she traveled to Mendon to attend his funeral and to see to the needs of her aging parents. She had the baby there and in the fall of 1870 Edwin came to Mendon long enough to bless the baby. They would never see each other again, as Edwin died a few years later while working in the Lord’s service. Ann partnered with her brother’s widow and between them they had 11 fatherless children that they raised together. 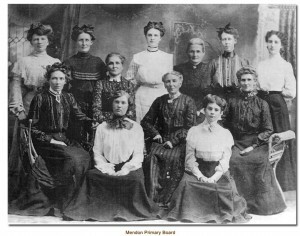 Ann’s talent with children must have been significant for she served as Primary President in Mendon for 37 years. The next century dawned with the Westover family focused on yet another new homestead — this one located in Rexburg, Idaho — a home that would continue to be a base for the family for another century and beyond.